Center yourself with this yogacentric guide to connecting the mind, body, and spirit. 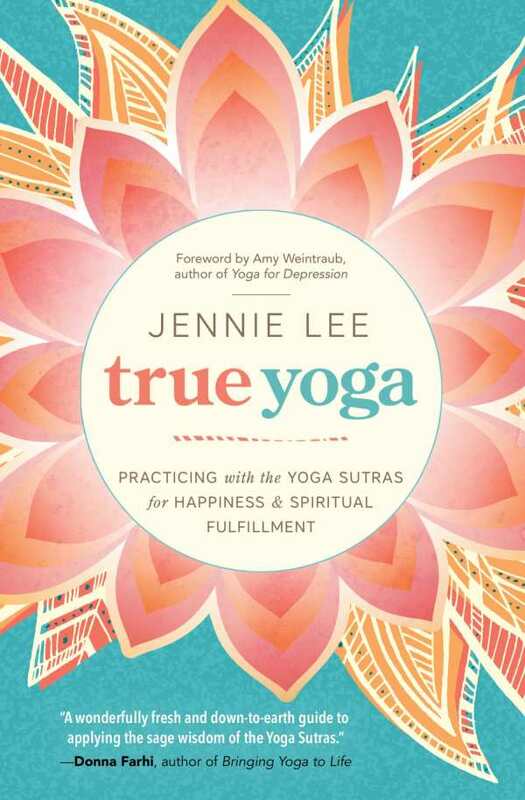 True Yoga, by yoga therapist Jennie Lee, is a motivational call to action to find enduring happiness, even when faced with difficulties. Lee’s friendly advice suggests ways to specifically choose happiness and to live a life that is balanced between giving and receiving. In a conversational tone, Lee emphasizes how yoga teachings can encourage one to be conscious and deliberate in all choices and actions. Chapters are broken down by the eight limbs of yoga, and those are divided into three parts of the book: inner harmony and connecting to one’s true nature, outer practices, and contemplative practices. Lee’s guidance is based on yoga sutras and traditional yoga practices. Her advice is supported by scientific studies that point to the effectiveness of the practices. Lee does not focus on instructing about yoga poses, although a chapter on asana discusses the physical practice of yoga. Instead, she focuses on the philosophical and spiritual aspects of yoga. She strongly suggests that yoga is not meant to be a physical practice alone. Sharing her own personal struggles and journey, and how she applied yoga teaching to cope, she makes the concepts relatable. Full of thought-provoking questions and suggestions, the book can be incorporated into a daily self-reflection exercise. Chapters can be read individually, even just a few pages at a time, to isolate concepts. The book is also an ideal long-term reference that can be reread often; as life experiences continue and evolve, the questions and suggestions will take on new meaning and offer fresh guidance. Lee’s advice is supportive and will interest those who already practice the physical aspects of yoga but are seeking deeper understanding of the philosophical and spiritual elements. It will also be useful to newcomers to yoga, providing a strong foundation for the connections between mind, body, and spirit.